Bulghour is a cooked, dried, and "cracked" wheat product that is a replacement or alternative for rice or other starches such as potatoes in many Middle Eastern cultures. Bulghour has one great advantage over other starches, as it does not have to be cooked. It can be reconstituted by soaking in hot or even cold water. It can be used as a stuffing for vegetables, fruits, poultry, and even a breast of lamb. Bulghour is the main ingredient of the Middle Eastern wheat salad, "Tabouleh". Imagine the advantage a food like this would have for the Mongol Hordes of Genghis Khan, who marched across Asia and the Middle East and having a product that would feed his armies without the need for cooking or the worry of spoilage. It is not only healthful, but a tasty food that marries well with the spices of the Middle East. Bulghour comes in four varieties. It can be used as a whole kernel after being cooked, but not yet cracked. Used as a barley, or whole wheat product that is already cooked but just needs reconstituting. For other recipes, it comes "cracked" into a fine, medium or coarse mill. Each has it's own use. Pilaf, as for this recipe, works best with the coarse milled product. Medium will also be acceptable. 6. Add the salt, pepper and chicken stock,  bring to a boiol and then turn the heat down to very low. 9. Add dry or fresh mint* (and some red pepper flakes* for a kick), mix and serve. tomatoes, garlic, pine nuts or just experiment on your own. You can use the above ingredients in combination or alone. Whatever pleases your taste. Armenians like butter! Turks like olive oil ..............I like both,  what can I say? NOTE: ALTHOUGH NOT THE EXACT RECIPE SHOWN,  THE VIDEO BELOW MIGHT BE OF HELP. 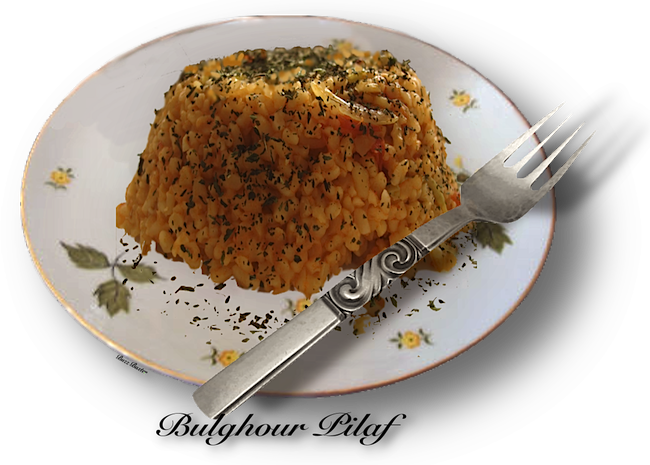 HOW TO MAKE BULGUR PILAFA video by the "Armenian Kitchen".